At the very worst time of my life, suddenly losing my beloved husband and closest friend and confidant, Anthony and Jim provided our family and me with gentleness, compassion, practical advice and time to absorb this surreal new reality. They treated us with kindness and dignity. The memorial service was conducted in a way that honored Bob, and Jim did an amazing video using photos and Bob's favorite music. Two years ago, Anthony was there for us when Bob's son passed, and Bob and I were so moved by his professionalism and sensitivity that we decided we wanted them to help us in the future. I feel truly blessed that under such devastating circumstances, our family and friends found Anthony and Jim. 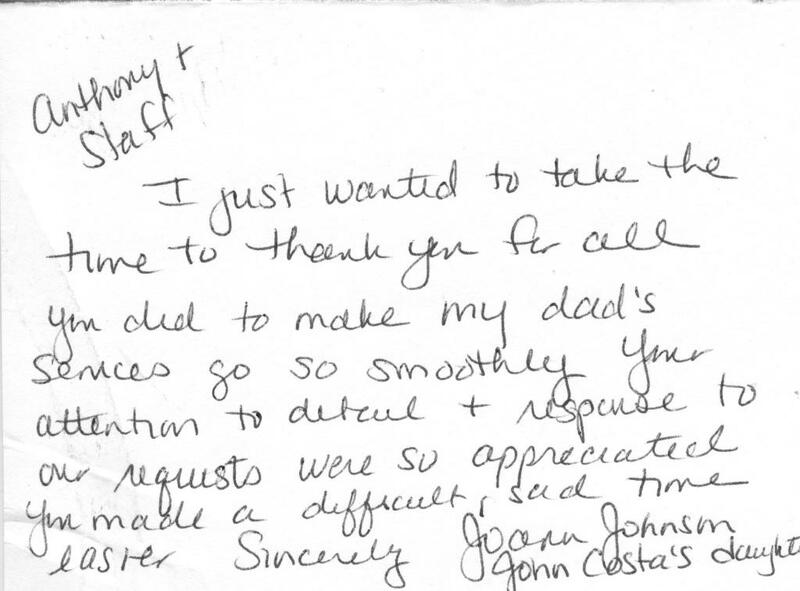 Anthony and Staff, Thank you for the kindness and special care yo showed our family during such a very difficult time. 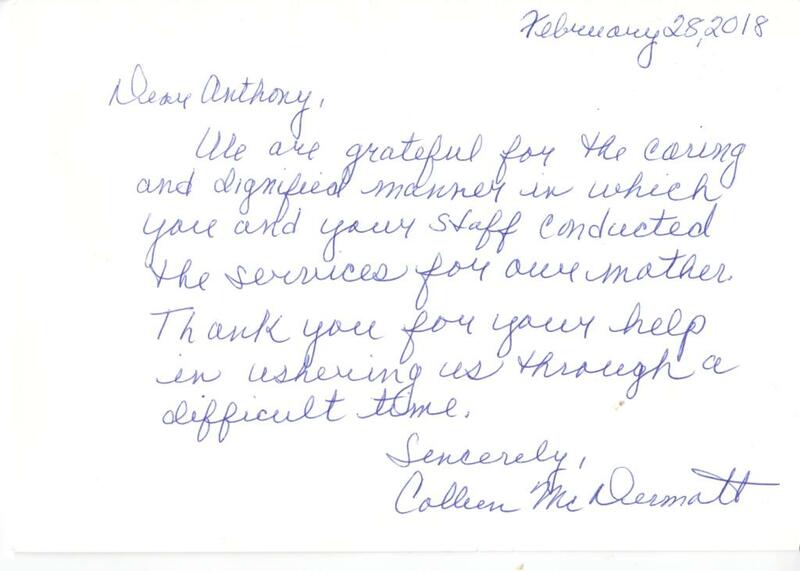 Dear Anthony, My family and I want to thank you for your kindness and the way you presented yourself. You are the best in your field, everyone commented on the beautiful service. Thank you once again. Anthony, Thank you for all you did for us in our time of need. It was appreciated. Thank you both so very much for the beautiful send-off for my mother. She would have loved the entire arrangements provided so professionally and respectfully . You helped make a sad time bearable. Many thanks for all your kindness and patients. Thank you so much for guiding us through this difficult process of saying goodbye to our loved one. 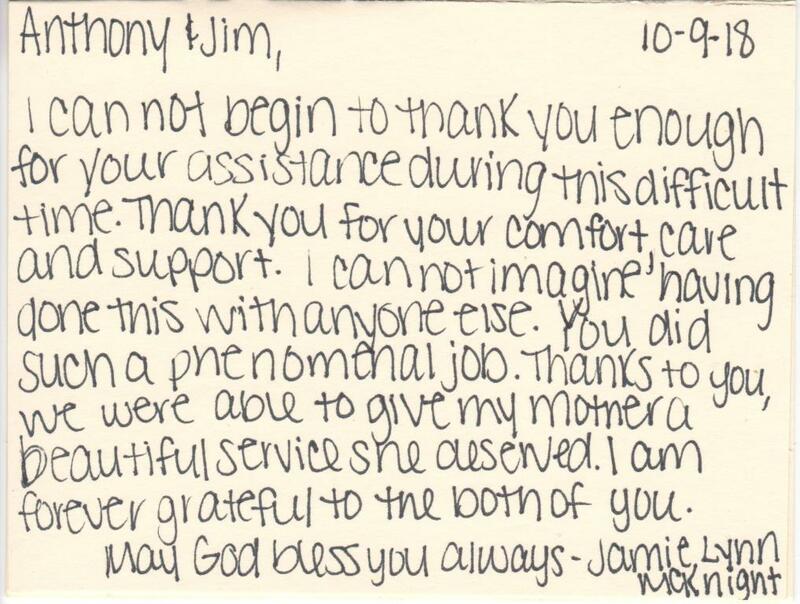 You are both very professional, caring people and we KNEW mom was in good hands with both of you watching over her. You were very patient with us and all our wishes were met. We were all thankful for the love and kindness you extended to us during this difficult time. Dear Anthony, Thank you for all the time you spent with us and helping us through the process of our mother's funeral. You made this difficult time easier for us. I would like to thank you for your professionalism, sincere concern, and support in the time of the loss of my father, Richard Gras, Sr. 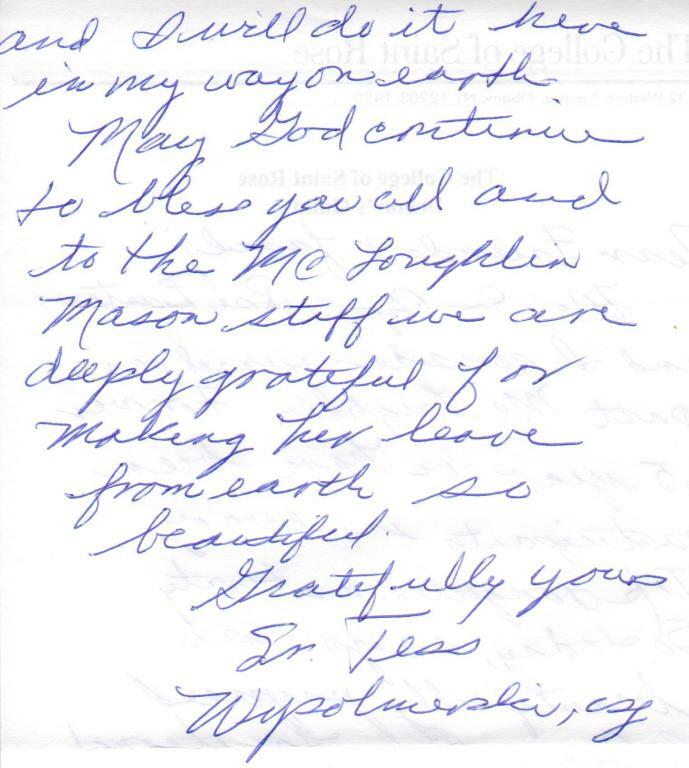 I was so impressed by the services and all the staff there at McLoughlin & Mason Funeral Home. Your staff made a very difficult time much easier on my family. My father's arrangements were truly something he would have approved of. Thank you really isn't an adequate to express how grateful my entire family is to you. the fact that you and your staff were able to pull of father's service together in such a professional and beautiful manner on a moments notice was simply amazing. All my siblings asked me to convey their deep appreciation to you. They were all very pleased with the entire service. On a more personal note, I cannot say enough for letting me see my father at your facility. It really helped me with some closure and gave me the ability to say goodbye. Anthony, being in the service industry I truly appreciate people that go above and beyond for their clients, and you are a true top professional. It's sometimes easy to forget that there are nice people out there doing nice things for others. Thanks for being such a special reminder. Thanks Anthony a million, from the Paulk and Small Family. Thank you so much for everything. We were deeply moved by the love and kindness you extended to us during this difficult time. Thank you for the hard work. Everything was perfect. Thanks for your thoughtfulness in preparing the remembrances: video, obituary, prayer cards! Your concern for us and shepherding spirit will never be forgotten. We are eternally grateful! Dear Mary, Frank's funeral was beautiful as was Jimmy's. I want to thank you for all your effort into making it so. I send best wishes for healthy and happy days to you and your family. 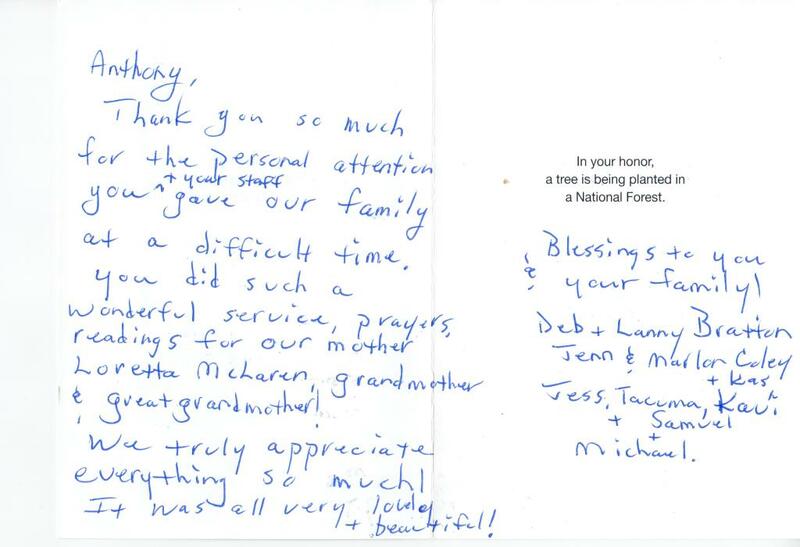 I can’t thank Anthony Perniciaro and everyone at McLoughlin & Mason Funeral Home enough. You went above and beyond the call of duty for the services for my father, Allen M. Bailey. Every request I made was met, including the fact that my father’s burial occurred on Tuesday, March 14, 2017, the day that Winter Storm “Stella” hit New York State. In the days leading up to the storm, Anthony ensured me that we would be able to complete the burial that day if we so wished. I did not want to postpone the event; storm or no storm. I could have been told that attempting the burial that day was out of the question, with good reason. But Anthony let me make the call and we succeeded with the funeral and the burial in the midst of a major snowstorm. 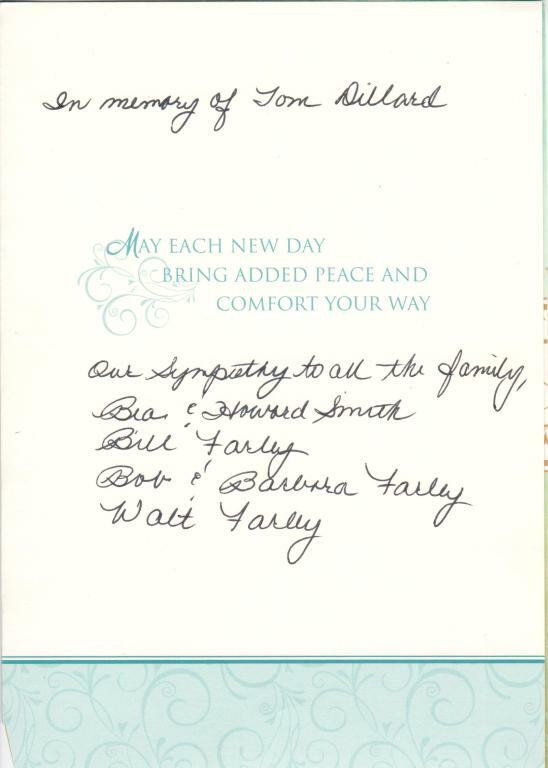 Everyone at M&M did their BEST to make sure that my family was transported safely to and from the funeral home, the church, and the cemetery. The burial ceremony went very smoothly given the circumstances. Anthony apologized to me that there would be no tent set up at the grave site due to the wind conditions, and so he supplied all who attended the ceremony with big umbrellas for protection. Finally, the fact that we were able to hold the burial ceremony in the snowstorm allowed me to create a memory that will be with me forever. My father introduced me to the world of music, and as a last goodbye I wanted to play a song on my guitar that he used to sing to me when I was a young boy sitting on his lap. As the snow was coming down, Anthony held an umbrella over me while I played the song. Most of New York State was shut down that day, but I was still able to honor my father as intended. I never heard the word “no”, “too cold”, “too snowy”, “too anything” from Anthony. Thank you so much Anthony and Mason & McLoughlin for an absolutely wonderful service. My family and I are truly grateful for your attention to our needs and your dedication to your practice. Dear Anthony, Thank you so much for all you did to guide us through the process of planning my father's arrangements, to overseeing them - carrying them out so beautifully. We truly felt Dad's wishes were met - no small fete as you may recall! You and your nephew were a pleasure to deal with in the most unpleasant of situations and you both handled everything perfectly for which my family is truly grateful. Dear Anthony, I can't thank you enough for your support in helping us plan for Bill's memorial service. During this very difficult time when I didn't know how or what to plan you patiently guided us thru the various options and offered suggestions that resulted in a very comforting service. I will always be grateful for your expert and professional help. Dear Mary & Anthony, Thank you so much for everything. Mom's wake and funeral was handled with professionalism and compassion. 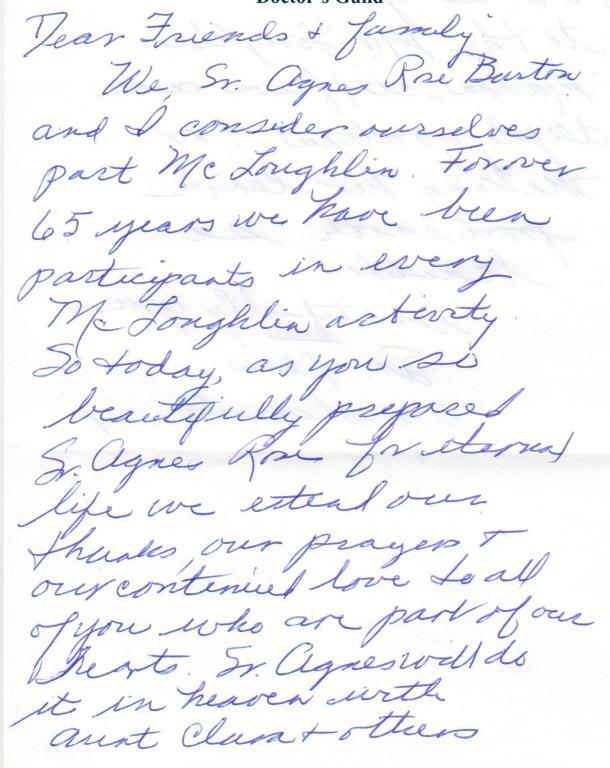 You were wonderful to all of us and we very much appreciate all of your efforts. Anthony, we cannot thank you enough for handling Patrick's wake and funeral. Your thoughtfulness and professionalism made our time of sorrow so much easier.